Wondering where to get essential services on Koh Rong? The answer is often Sihanoukville, but more and more is available on the island. Koh Rong expats generally live part-time in Sihanoukville. 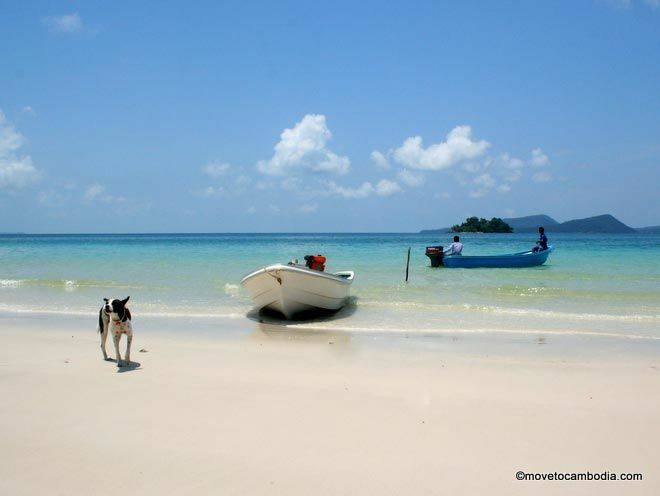 Even if they don’t, they head to the mainland for essentials like vet care and medical care (although there is limited medical care on Koh Rong). Check out our list of list of Sihanoukville expat essentials, from groceries to veterinarians. Need clean duds? Here’s the info on laundry and other essentials on Koh Rong. 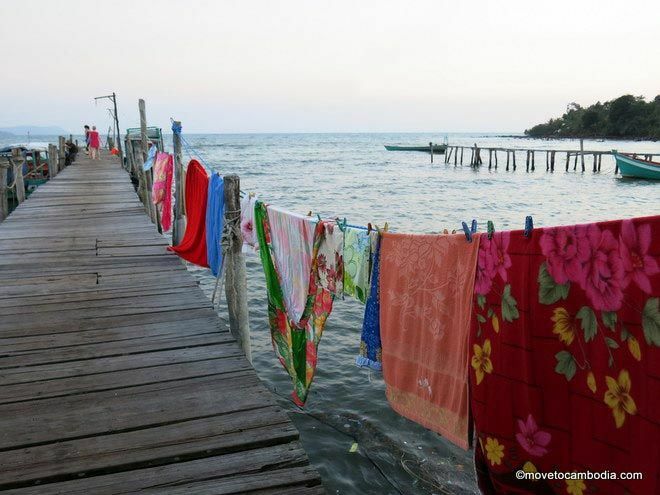 Quite a few places on Koh Rong offer laundry services these days. Most cost $1 per kg and everything is washed by hand. We like Bong’s in Koh Toch Village, but we’ve heard they’ve gotten a washing machine at Jungle Bar. Be aware that all water on Koh Rong comes from wells, which means the water is mineral-rich and can contain lots of iron, which will stain light-colored clothing. So if you’ve brought a favorite white shirt with you, consider taking your laundry to shore and washing it in Sihanoukville. Depending on your carrier, phone reception on the island can be spotty or nonexistent. WiFi internet is available at many of the guesthouses, but bandwidth is limited and the connection can be down for hours at a time. If you require phone or Internet while you are on Koh Rong, get a Metfone or Smart SIM card before you arrive. It’s even possible to get a 4G connection with Smart, and you can create a hotspot with your phone to get your laptop online. There are a few minimarts near Koh Toch pier where you can buy drinks, snacks, and other bits and bobs, although, island-style, they have a limited (and often overpriced) selection. The shop at White Dragon has the widest selection of goods, including helpful items you might have forgotten, such as diapers or a Frisbee. Phoenix Minimart offers water bottle refills for 2,000 riel ($0.50) as well as a surprisingly large selection of wine. If you’re looking for more, there are several large supermarkets in Sihanoukville. It’s possible to get basic pet care on Koh Rong, but there are more options on shore in Sihanoukville. Most Koh Rong expats head to Sihanoukville for veterinary care, but there are a few basic services on the island, through the Pups in Paradise organization. Rabies vaccinations are available, as well as treatment for worms, mange, fleas, ticks, and other common ailments. Additionally, the Phnom Penh Animal Welfare Society (PPAWS) brings qualified veterinarians to Koh Rong every three months or so, offering a wide range of services and surgeries. They have open consultation hours for simple things like vaccinations, but for anything more complicated you should make an appointment in advance. They offer free services for beach dogs, but if you’re a pet owner prices can be on the high side (vaccinations $20 to $30, cat spaying/neutering $90/$40, and dog spaying/neutering $120/$90). The care you receive is high quality, though, and from properly qualified veterinarians (and you’ll be spared making a trip to Sihanoukville). Akareach Animals Clinic, a veterinarian in Sihanoukville, is willing to come to the island for emergencies. If you’re looking to meet other Koh Rong expats, they aren’t hard to find around the island! Online, you can get island updates and have your questions answered in the Koh Rong Community Facebook group for expats and locals.